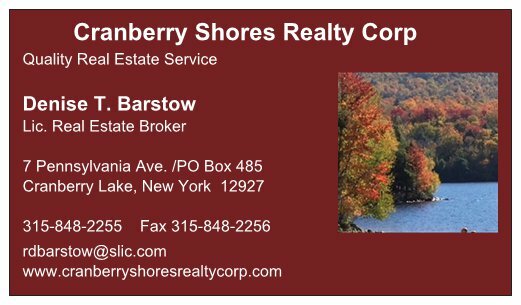 Cranberry Shores Realty Corp has gained a well–deserved reputation as a top Cranberry Lake real estate brokerage company. We couldn’t have done this without our professional and well–trained staff. We want you to know who you’ll be talking to and dealing with, so here are some introductions. I am a St. Lawrence County native having grown up in Canton. I am a graduate of Canton Central High School. My husband and I relocated to Cranberry Lake in 2003. My current hobbies include spending time with family and friends, traveling, and volunteering. Some of my volunteer work includes being a Critical Care EMT with the Cranberry Lake Fire and Rescue as well as Asst. 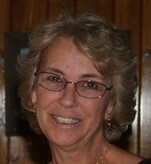 Chief of EMS, the department Secretary and President of The Cranberry Lake Fireman's Auxiliary. As a licensed Realtor®, I specialize in representing my clients in the purchase and sale of residential and income property within St. Lawrence County; specializing in Cranberry Lake and Star Lake. I truly love this area and pride myself on my knowledge of current transactions, school districts and neighborhood information. Other related services would include mortgage, insurance and home inspection information.